As cute as a button is a beluga whale that looks at you with his little eyes and big smile where they reside in the cold Arctic waters. A beluga whale also known as a white whale lives in the arctic and sub-arctic waters of Canada, Alaska, Greenland, Norway and the Soviet Union. They are usually found along inlets, fjords, channels, bays and the shallower waters of the Arctic where they find better feeding areas or have their young. 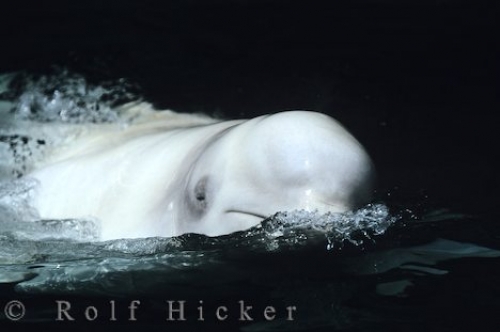 As this beluga surfaces you get a good look at his melon shaped head and white skin which is about fifty percent fat. When a beluga whale is born, their coloring is dark gray and as they age they turn into these beautiful snow white mammals that travel and play in pods that can reach up to hundreds. Their heads are very flexible as their backbones are not fused together like many others in the cetacean families, so that they can move their head from side to side and up and down. This is another reason that the Beluga Whale can make many facial expressions as if it is always smiling. Photo of a beluga whale surfacing to have a look around and see what the surface has to offer, Churchill, Manitoba, Canada. The small dark eyes of the Beluga Whale are situated just behind the corners of its mouth as you can see in this picture with a single blowhole located on the top of his melon. Their blowholes are ideal for producing a mass amount of noise such as squeals, whistles, moos, chirps and clicks which is great for communication with other beluga whales as well as locating food. The greatest fear of the Beluga is polar bears and killer whales as once they get stuck in the arctic ice, their energy decreases and it makes them an easy target for the Polar Bears. To see a Beluga whale in its natural environment, be sure to book an tour with one of the many whale watching tours available. The adorable smiles of the beluga whale and the white bodies surfacing through the Arctic waters is well worth the journey.